Teeth whitening is a cosmetic dental procedure done to enhance a person’s smile. A bright white smile is enviable among many, and it is one of the easiest dental cosmetic procedures to have done. While many people attempt to whiten their teeth themselves using an at home treatment, Green Dental of Alexandria offers safe and effective whitening treatments that will help our patients achieve a whiter, brighter, more beautiful smile with professional results. Green Dental of Alexandria is a comprehensive family dental practice that uses the best and safest materials the industry has to offer – for both our patients and the environment. Professional teeth whitening is the world’s most popular cosmetic dental procedure. 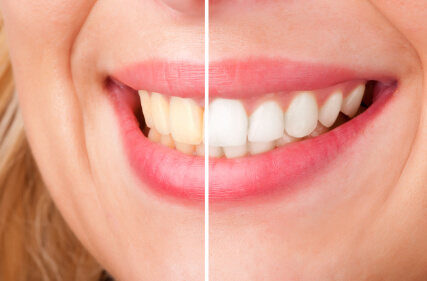 In-office whitening treatments allow dentists to use a concentrated whitening agent in a safe, controlled, and pain free method in order to produce immediate results for patients. One of the main complaints with at home teeth whitening is tooth sensitivity. This drawback has been virtually eliminated due to thicker peroxide gels and the use of desensitizers in the dentist’s office. Dr. Hye Y. Park and the dedicated team at Green Dental of Alexandria understand how important a person’s smile is to his or her appearance and confidence. Green Dental of Alexandria is the dental practice to trust in Northern Virginia for all of your dental needs. As a comprehensive family dental practice, we offer a variety of services including teeth whitening. We are also pleased to offer convenient hours so that your dental appointment can be worked easily into your busy schedule. Call us today to schedule your appointment for a whiter, brighter, and healthier smile.